Sakai is an open source collaboration and learning environment. Sakai Guides and DocumentationSakai Basics Site InfoWhat is the Site Info tool? What is the Site Info tool? The Site Info tool contains many of the course management features needed for instructors to customize and manage their courses. 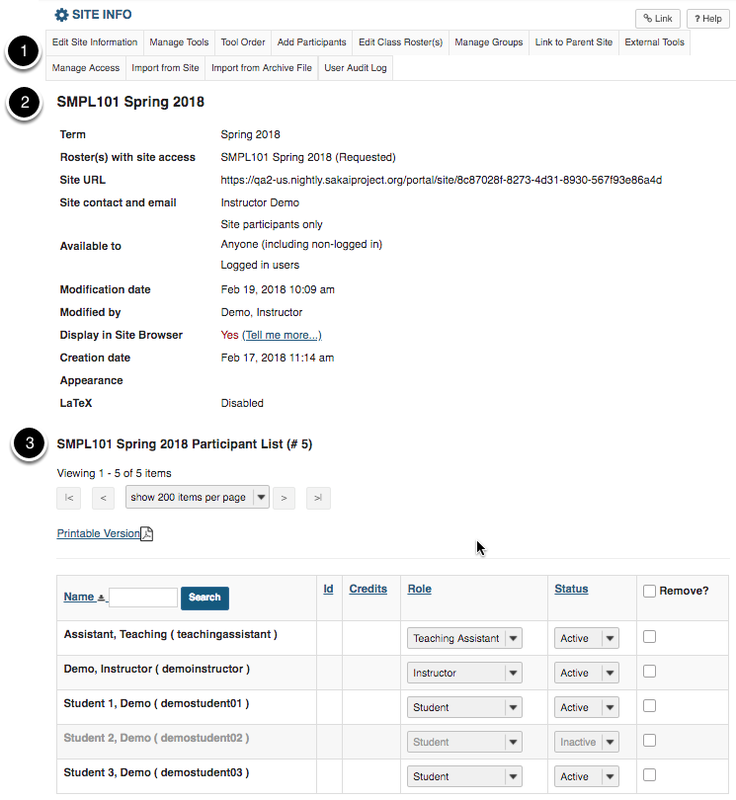 Instructors may edit and rearrange the tools on their course toolbar, add participants, manage groups, publish or unpublish their course, import content from another site, and track participant enrollment activity. If you have limited site permissions (i.e. participant), you'll see only the site's description and your group memberships, if applicable, in Site Info. Note: The functions of the Site Info tool are also available through the Worksite Setup tool, which is available from the Tool Menu when you are in My Workspace. To access this tool, select Site Info from the Tool Menu of your site. Select the Site Info tool from the Tool Menu of your site. View Tabs, Site Information, and Participant List. Site Info Tabs - Tabs for instructors to customize and manage the site. Site Information - Information about the site such as Site Title, Term, Roster, Site URL, and Contact Information. Participant List - A list of site participants with their Name, Role, and Status. Prev: What does Unpublished Site mean? Next: How do I edit the site information? What is the Home Tool Menu? What is the Home Message of the Day? What is the Home Calendar? What is the Home Information Display? What are the Home Recent Announcements? What are the Home Message Center Notifications? How do I view and edit my account details? What is the Preferences tool? What are the Resources in Home? How do I assign grader permissions to teaching assistants? How do I create a new course or project site? How do I navigate among different sites? How do I navigate within a site? How do I reset a tool? What does Unpublished Site mean? How do I edit the site information? How do I add tools to my site? How do I rearrange or rename the items in the Tool Menu? How do I add users to my course or project? How do I remove participants from my site? How do I add a class roster? How do I delete a class roster? How do I use groups? How do I link to a parent site? How do I control site access? How do I make my site publicly available? How do I copy my content from one site to another? How do I import content from an archive file? What is the User Audit Log? How do I add LaTeX language to my course site? How do I remove a tool from my site? How do I hide or show items in the Tool Menu? How do I change participant roles within a site? What are Permissions and Roles? How do I login to Sakai? How do guests create an account? What does it mean to make content accessible? What are some guidelines for making content accessible? How can I make images more accessible? How can I make tables more accessible? How can I make videos and audio files more accessible? How can I make links accessible? How can I make lists of items accessible? How can choices in background and text color affect accessibility? How can I structure my document to make it more accessible? Why should I use paragraph breaks in my document? What is the Rich-Text Editor? What actions can I perform using the Rich Text Editor icons? What are some keyboard shortcuts for the Rich-Text Editor? How do I create a link to a web site in a text box? How do I create a link to a Resources item in a text box? How do I create a link to an activity in a text box? How do I embed an image in a text box? How do I embed a linked web image in a text box? How do I embed a YouTube video in a text box? How do I add special characters to a text box? How do I add/edit a table in a text box? How do I add a content template to a text box? How do I paste text from a Microsoft Word document to a text box? How do I embed an mp4 video in a text box? How do I embed an mp3 audio in a text box? How do I set my preference for the Rich-Text Editor mode? What is the Profile tool? How do I post a status message to my profile? How do I add pictures to my profile picture gallery? How do I search for and add connections? How do I accept a connection request? How do I send a message to a connection in Profile? How do I change my privacy settings? How do I set my notification and other profile preferences? What is the Resources tool? How do I navigate the Resources tool? How do I create folders? How do I upload files to Resources? How do I upload and unpack a zip file to a Resources folder? How do I create a zip archive file in Resources? How do I add a web link or URL? How do I create a text document? How do I create an HTML page? How do I create a citation list? How do I move a file or folder within Resources in the same site? How do I copy a file or folder within Resources in the same site? How do I copy a Resources file or folder from one site to another site? How do I reorder files or folders within Resources? How do I upload a new version of a file in Resources? How do I hide files and folders? How do I unhide files or folders? How do I set the display of a Resources item to a specific time period? How do I remove a file or folder in Resources? How do I restore a removed file or folder in Resources? How do I add and display contextual information about a file or folder? How do I notify site participants that content has been added to Resources? How do I obtain the URL for a file or folder in Resources? How do I make a link to a Resources folder appear in the Tool Menu? How do I create a group folder in Resources? How do I allow group members to upload content to a group Resources folder? How do I allow all students to upload content to a selected folder? How do I make a file or folder publicly viewable? What is the Resources quota? How do I transfer files to Resources using WebDAV? How do I attach files from my Home Resources to submissions in my other sites? What is the Announcements tool? How do I add an announcement? How do I edit an announcement? How do I delete an announcement? How do I merge announcements? How do I reorder announcements? How do I change Announcements tool permissions? How do I view announcements? What is the Email tool? What is the Chat Room tool? For immediate help or support, contact the OIT Service Desk. Register for a Sakai Workshop. Attend Duke Learning Innovation Office Hours offered several times a week. No registration is required. Contact Duke Learning Innovation for 1-1 consultations or custom departmental training (groups of 5 or more). How do I use Warpwire with Sakai? How can students avoid problems when taking online tests?